Whoever took the idea of re-using existing GI Joe tooling to create low-cost figures for Dollar General and decided they should be throwback repaints to the early '90s era of Joedom was a genius. They deserve a raise. They've taken what was essentially a way to make some quick cash for Hasbro and turned it into something people are actually interested in. My first Cobra Commander figure ever was the 1991 version: bright blue jumpsuit, gold helmet, translucent orange mask, weird plastic launching glider... so not very Cobra Commandery. I fixed that in 1993 by picking up a new CC, this time in his iconic hooded outfit. Supreme commander of the Cobra Legions, contraband arms merchant, international terrorist, and real estate swindler, Cobra Commander is the ultimate enemy of GI Joe. Although no Cobra Vipers or even his most trusted Crimson Guard Commanders have ever seen his face, they know the man behind the mask is the most diabolical villain imaginable. This ruthless leader's principle [sic] desire is to totally crush the GI Joe Team, and take over the world while he's at it! His numerous attempts to accomplish this distorted dream of world dominance have so far been foiled by the Joes, but they are always on the alert because Cobra Commander keeps coming back stronger and stronger, with incredibly destructive weapons and vehicles! 1993 Cobra Commander (whose filecard you just read) was mostly a repaint of the "Talking Battle Commander" CC figure, except he was done in black and silver instead of blue and yellow. And also he lacked the giant battery-powered backpack that would scream phrases at you when you pressed a button. Incidentally, this was actually the first time CC showed up in a black uniform. Nowadays, it seems every CC figure can expect a black repaint, but 1993 was the first. Hasbro's Dollar General Cobra Commander pays homage to that wondrous year that was 1993, giving us a hooded CC with black uniform and silver trim. Sculpturally, he uses no new parts, but all his parts are pieced together from various Cobra Commander figures. The bulk of the figure (head, torso, and webgear) comes from the Comic Pack figure (that came with Tripwire), which was already a repaint of the Generation 3 Crimson Guard figure with a new hooded head. Thankfully, the legs of this figure aren't re-used from the CG, because the thigh holster strap would have almost certainly gone empty as it did in the Comic Pack, and empty holsters bother me. The legs are a combination of two different CC figures: the earliest G3 CC figure and the Resolute CC. The arms are from the Renegades CC, which is nice because they get some additional wrist articulation. It all works together pretty well to give us a nice "new" Commander that utilizes no actual new parts. The cost-cutting measures are evident in the paint. 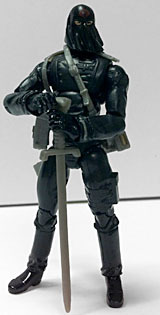 The figure is molded in black plastic, with silver for the webgear and epaulets. The only actual paint apps on the figure itself are the tan for the eyeholes, red for the cobra logo tampo on the hood, and silver for one of the cuffs on each wrist (each wrist has two cuffs and only one is painted). The silver webgear features a bright red belt buckle, and that's it. There are quite a few details on the figure that are just begging for paint, including the medals and buttons on his torso. I may have to break out the acrylics to bring him up to the same level as the rest of the figures on my shelf. The articulation is what we've come to expect from G3 Joes, with the nice addition of peg-and-hinge wrists so that he can get some really nice poses from the included accessories. The webgear features a holster and a sword sheath, and he gets a pistol and a sword to fit them. The whole assembly and accessories are repaints from the Comic Pack CC, but they're pretty nice, particularly the sculpted cobra hood hilt on the sword. He doesn't get the cape from the Comic Pack version, but he does get a plain Cobra base. This figure is pretty bland, but I have a soft spot for that 1993 Commander, since he was my first "iconic" CC figure. Overall it's a solid kitbash of CC parts, but the lack of paint really hurts the figure. It's understandable in these lower cost figures, and it shouldn't be too hard to customize, but there's really not a lot to make this figure stand out. 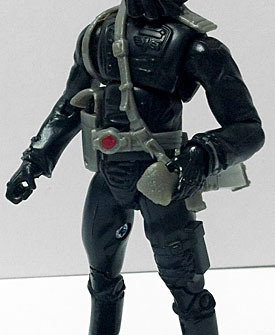 Back in '93, a black uniform for Cobra Commander was a new concept, but today they're seriously very very common. He's a nice throwback if you remember the '90s, but he's not really anything special today in a sea of 50 other Cobra Commander figures.